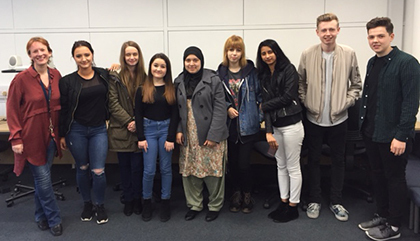 Psychology students at The Sixth Form College, Solihull visited the University of Warwick last week to get a taste of undergraduate study and complete some project work with staff at the university. The A level students are all part of the College’s Psychology Research School, which is a specialist enrichment option offered to students who want to continue their Psychology studies at university. By being involved in this academy, the students work with staff from the College’s Psychology department and staff at the University of Warwick to develop their Psychology understanding beyond that which is required in A level study. They visited the university to benefit from the expertise of Dr Elisabeth Blagrove, who is an ex-student of the College and now a Psychology lecturer at the university, specialising in selective and social attention, as well as processing of emotional faces. During this trip, the students completed research on face recognition (visual field research) on a range of participants. They analysed their data using a statistical package and they used the state-of-the-art driving simulator and viewed the Sleep and Pain lab in the Psychology building. As part of this exciting initiative, the students will undertake a piece of personal research on a psychological topic of their choice and complete an Extended Project Qualification (EPQ). Students will be required to research this topic in detail and produce an artefact (be it a poster, leaflet, magazine, etc) related to their study. The Extended Projects that the students complete will provide them with qualifications equivalent to an A level and, as such, will significantly boost the students’ ambitions of progressing onto Higher Education.